In a recent movie on Emily Dickinson, I was reminded of the vast difference between the faith of the Lutheran Reformation, and many forms of American religion that followed in its wake. The other forms held sway for a long time, but biting portrayals by novelists dismantled the evangelistic methods. 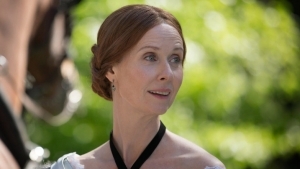 “A Quiet Passion,” which stars Cynthia Nixon, offers us such a portrait of a world lost to many of us, and portrays both a heroic stand against spiritual abuse, and how needy even the heroic remain of true consolation. As the movie begins, the school year is drawing to a close, and the headmistress says that, as is her custom, she has a question of utmost importance to present to the girls. The question concerns their spiritual wellbeing. The woman is stern of expression. She appears to be a force to be reckoned with. “Do you wish to come to God and be saved?” she asks. “Those of you who wish to be Christian and saved will move to my right,” she directs, and several girls move to her right. Not all have responded. They are given another chance. “Those of you who remain and hope to be saved will move to my left,” she allows, and a larger number of girls move to her left. This is reminiscent of the Judgment scene in Matthew 25. Some judge themselves to be goats in the present, but there is still hope for them in the future. Emily Dickinson remains standing in the center, alone. She will not sort herself according to the given categories. “Have you said your prayers?” asks the woman. “Yes, but that can’t make much difference to the Creator,” Dickinson answers, in a tone that sounds self-assured, even under questioning. “Do I understand you correctly? Do you believe that your creator is indifferent to your sins, that in his mercy he sees your slumber?” The headmistress is quite perturbed. Is she fearful for Emily? Or afraid of what Emily’s non-conformity might arouse in others? “No, you misunderstand me. I’ve not got so far. I am not even awakened yet. And how should I repent? I am somewhat troubled, to be sure, but my feelings are all indefinite.” We are clearly in the realm of Jonathan Edwards’ Religious Affections. What matters in that scheme of salvation is the increase in affections. Edwards can cite many Scriptures that speak of this. Hard-heartedness is, to be sure, a grave sin. Edwards believes that God has elected a certain number of individuals to be saved, and that they can discover whether they are of that number if their affections are of a supernatural nature. Naturally occurring affections do not count. Evidence of sanctification is necessary before the person can be assured that Christ atoned for them. In Edwards’s reasoning, knowledge of sanctification precedes knowledge of Justification. He says that the idea that people would know of their salvation first, and then be grateful and improve, would demonstrate a merely natural affection. The clearest verse that would justify an understanding of salvation that put Justification first, that we love God because He first loved us (1 John 4:19), Edwards reads not as our loving God in response to hearing He saved us, but that first God elected some, and then the elect, moved by the Holy Spirit, loved Him, apart from any consideration of Christ’s benefits to them. To discover these supernatural affections was to make your calling and election sure. This focus on affections had a powerful influence on evangelistic methods and revivalism for many decades. In modern times, this focus on affections continues, but more often in advertising. And now the evangelists follow the advertising agencies in trying to win people. But in the past, the evangelist did not feel such a need to be winsome. “The question is not how far you have advanced, but how far you ought to have advanced, not how you feel, but how you ought to feel.” The schoolmistress is in a quandary here. She probably takes Emily at her word about not being awakened. But she considers inability as no excuse, which, of course, it is not. The question is, once inability is recognized, what is the proper course? Do you keep insisting on the standard, or is it time to apply the remedy? The headmistress presses the standard on Emily. “I don’t feel anything. I have no sense of my sins. And how can I? I wish I could feel as others do, but it is not possible.” The modern viewer is likely expected to see Emily as a lone individual standing against the crowd. The others have put themselves into one of the two earlier categories to conform socially. Had everyone done this, they could have gotten on with the morning as planned. Emily, thinking nothing of the social consequences, tells the truth. “A sinner against a holy God and under condemnation and liable every moment to drop into a burning, hopeless eternity, yet cannot feel, cannot be alarmed, cannot flee from the wrath to come. The true question is, are you in the Ark of safety?” Here I wonder what the Ark of safety is supposed to signify. The church? Historically, the church has been seen as the Ark of safety. Baptism joins us to the church, which was prefigured by Noah’s ark. I would guess that in the congregational church, Emily had been baptized. But at this stage in its development, the role of the sacraments was downplayed. It was more likely that the Ark of safety was internal good intentions. “I fear I am not.” Again, Emily will not make this easier. “You are alone in your rebellion, Miss Dickenson. I fear you are a no-hoper.” Had I believed the headmistress, I think I would be, too, given that no hope had been preached at this point. There has been talk of God and souls and perdition. But no Christ. “Yes, Miss Lyon.” Emily is content with the idea that Miss Lyon sees the world as she does. In fact, Emily seems to agree with her on the importance of affections. She will stand alone if that is what it takes to be true to her affections. She is not willing to lie about having an affection that she doesn’t have. Yet she is effusive in expressing the ones she does have. In the following scene, reminiscent of the one in A Christmas Carol where a younger sister comes to take Ebeneezer Scrooge back home from the lonely school, Emily Dickinson’s father and brother and sister arrive to take her home. She is overjoyed to see them, and only wishes her mother could be with them. It would make her joy complete. Her affections are set upon a small set of people in this world. “We were concerned by your last letter,” says brother. “You spoke of being ill,” says sister. “Yes. What is it that you are suffering from?” asks father, full of compassion. “An acute case of evangelism,” answers Emily, with a chuckle of relief. There is so much that can be said of this scene. But the first point to make is that the form of religion it presents is foreign to me. Not altogether foreign. I suffered from a few acute cases of evangelism in my youth. Sometimes I was convinced I was already converted. Other times they got me convinced that I wasn’t. In most cases, the deal set before me was easier than what the headmistress presented to Emily. But some of the same questions arose. Was I sincere? Had I felt the feeling that I was supposed to feel? When I was at a meeting with an altar call, I once saw a guy who was bawling when he went down front. Why didn’t I feel that? My entry into a more Reformational understanding of things did not come from choosing an easier path. At least, that was not how I got there. I attempted to live under Lordship Salvation for a brief time, and found it didn’t work. Or, that I could make myself obey externally with more rigor, but my affections were killed off by doing so. There would always be some area that would not give, and I would be sour over it. As I came to read the Reformers, I found their words comforting. I started to hope again. But one particular book sharpened something for me. The book was Living by Grace by William Hordern. The book had a chapter on the true nature of righteousness that made me see yet again how unrighteous I was. Worse yet, it made me see how the inability was not something that could be overcome by any program or form of rigorousness. It wasn’t just me. I knew it was human nature itself. Even the human nature of those much better than I. The rigorous could always be shown to have at some point relaxed the standard. There is no one righteous, no not one. Only in Jesus do we find the righteousness that is required. “A Quiet Passion” is a tragic movie. On some level, I respond as the film makers would wish. I rather admire Emily Dickinson in her rebellion. Why? Because she is so honest. Yet I wish she could have heard a real evangelist. The one who preached to her was acute, by comparison with most we see today. It’s almost refreshing to see someone who isn’t tailoring things to appeal to human desire. Yet the preaching was still obtuse. Any modern viewer is expected to see this. There is too much of a ‘speaking down from on high’ in the headmistress. She seems to enjoy it too much. She loves to question, yet she cannot stand to be questioned. She can be pierced by a sharper tongue. Emily clearly has the superior nature. She appears to have saved her soul by remaining a lost soul. The headmistress has become a distorted woman by trying to save herself. Yet all is not right for Emily. Part of what makes her nature better is that she can see herself, and what she sees torments her. This is visible over and over again. Those times when she doesn’t see it for herself, a family member points it out. Either way, she does see it, and at that moment does appear to have become a no-hoper, even if the hope is earthly. The family member offers consolation. Yet there is a better consolation to be had. The good news is that we have not been left to ourselves like this. Some might consider it good news that there is supernatural power available to help us in our weakness. But the good news is better than that. For we are too weak to consistently use the available help. The good news is that while we were yet sinners, Christ died for us. He was pierced for our transgressions, and not merely by sharp words. When we were baptized, we were baptized into Christ, whether we understood that or not. We are not alone in our rebellion. The Lamb of God became our scapegoat, and took our sins upon Him. Wherever we find ourselves standing, He will turn to us, as far as He has to, until we are on His right. We will be rescued from a world of pain—and of acute evangelism. Even blog posts like this will have come to an end.